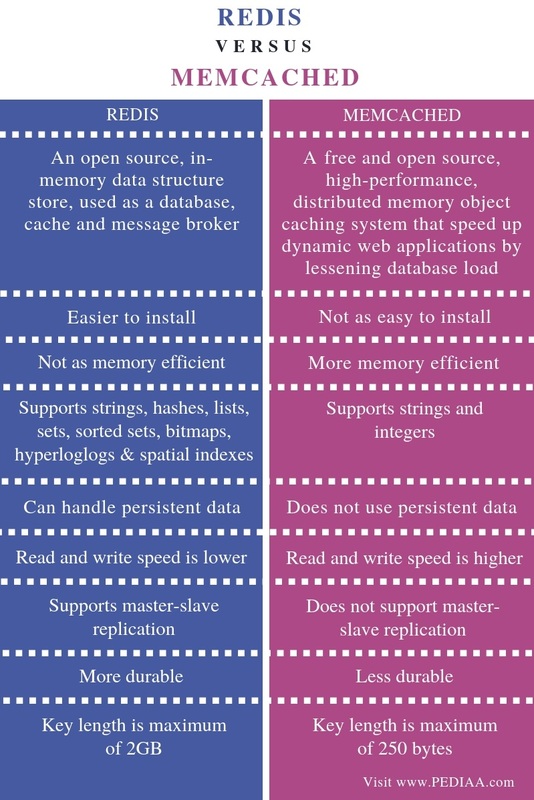 The main difference between Redis and Memcached is that Redis is an open source, key-value store that helps to build scalable web applications while Memcached is an open source, high performance distributed memory caching system that speeds up web applications by reducing the database loads. Big data refers to a collection of large data set. It has three properties as volume, variety and velocity. Volume refers to the amount of data while variety refers to various types of data and velocity refers to the speed of generating data. However, relational database management systems are not suitable to store this kind of large data sets. Redis and Memcached provide solutions to store them. Redis is an open source, key value store that helps to build high-performance, scalable web applications. It stands for Remote Dictionary Server. It supports data structures such as strings, hashes, lists, sets, sorted sets, bitmaps, hyperloglogs and spatial indexes. Moreover, it stores data in key value pairs. The major programming language used to write Redis is C language. 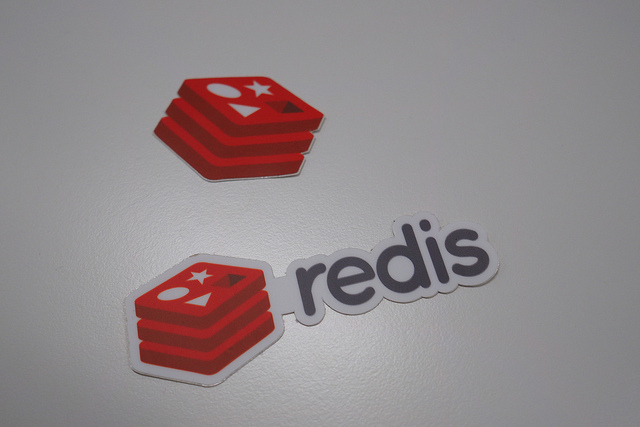 These are multiple advantages of using Redis. It stores data in the memory. Therefore, it works faster. There are also options to write data to the disk. Moreover, it is possible to use Redis with another database. There is a massive amount of data in enterprise level applications. It is possible to keep the frequently required data in Redis and store the rest of the data in some other database. 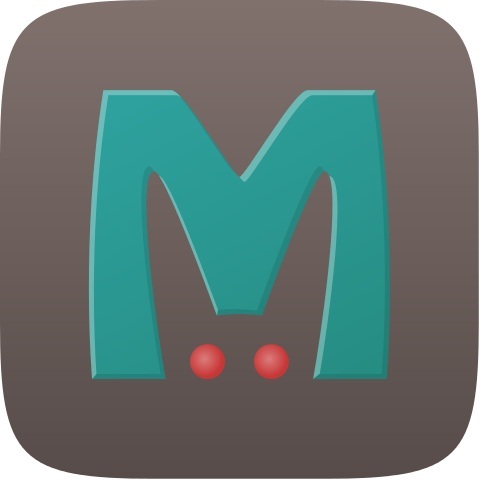 Memcached is a general-purpose distributed memory caching system. Moreover, it is capable of caching data and objects in RAM to minimize the number of times an external data source must be read. Therefore, it helps to speed up dynamic database-driven websites. The Memcached API provides a massive hash table distributed across multiple devices. Memcached is suitable to handle high database loads. Many systems such as YouTube, Reddit, Facebook, Twitter, Wikipedia and Pinterest use Memcached. Furthermore, applications such as Microsoft Azure, Amazon web services and Google App Engine provides Memcached service via an API. Redis is an open source, in-memory data structure store, used as a database, cache and message broker. In contrast, Memcached is a free and open source, high-performance, distributed memory object caching system that speed up dynamic web applications by lessening database load. These definitions explain the main difference between Redis and Memcached. Salvatore Sanfilippo developed Redis while Danga Interactive developed Memcached. There is also a difference between Redis and Memcached in installation. It is easier to install Redis when compared to Memcached. Memory efficiency is another difference between Redis and Memcached. Memcached is more memory efficient than Redis as it requires minimum memory resources for metadata. Moreover, Redis supports strings, hashes, lists, sets, sorted sets, bitmaps, hyperloglogs and spatial indexes while Memcached supports strings and integers. Redis can handle persistent data while Memcached does not use persistent data. Hence, this is also a difference between Redis and Memcached. Another difference between Redis and Memcached is execution speed; Memcached’s read and write speed is higher than Redis. Furthermore, Redis supports master-slave replication while Memcached does not. Another difference between Redis and Memcached is that Redis is more durable than Memcached. The key length of Redis is maximum of 2GB while the key length of Memcached is maximum of 250 bytes. Redis is an open source, key-value store that helps to build scalable web applications while Memcached is an open source, high performance distributed memory caching system that speed up web applications by reducing the database loads. Thus, this is the main difference between Redis and Memcached. 1. “What Is REDIS”, Automation Step by Step – Raghav Pal, 21 Apr. 2017, Available here. 2. “Memcached.” Wikipedia, Wikimedia Foundation, 18 Nov. 2018, Available here.